Race day is Sunday, and you’ll be able to follow the 2018 Molokai-2-Oahu Paddleboard World Championships (let’s just go with M2O) via live updates on the official site and finish line live video on the Facebook (plus regular coverage on the The Paddle League Facebook & Insta). In the meantime, here’s a quick look at the top contenders for this year’s Molokai crown. While there are countless divisions in M2O, the unlimited SUP showdown has become the most-watched race in recent years. There have been some classic duels in recent years between Connor, Travis and Kai, but this year will be an all-out battle royale with the deepest field of top contenders we’ve ever seen. It’s damn hard to bet against Travis/Connor given their sheer dominance over the past seven years, but I have a feeling a fresh new champ will emerge this year. Lincoln Dews and Titouan Puyo are the likely contenders in my opinion, while the “smokeys” are James Casey, fellow Aussie Ty Judson and local boy Mo Freitas. Lincoln Dews has the self-belief that can take him over the line. He’s done this crossing a few times, both standing up and on his knees, and in 2015 was neck-and-neck with Trav before fading to third. I’ll be shocked if this guy isn’t on the podium, and I won’t be surprised if he’s standing on the top step. That win against Boothy in Germany gave him a surge of confidence. Linc is currently #2 on the world rankings and finally, after several years on the fringes, realises he belongs among the world’s best. The dark horses are Aussie duo James Casey – an experienced competitor in this event and close runner-up to Connor at M2M – and Ty Judson. Jimmy’s pedigree in this event is well known, and while I’ve been extremely impressed with Ty’s results this season he lacks the necessary Molokai experience. Still a young kid though – he’ll win this race eventually I’m quite certain. Also don’t forget Mo Freitas. Hasn’t had a career-best season but did show in Carolina (where he almost stole the victory from Boothy and Trav) that he’s got the pace to match it with anyone. He’s officially entered in stock but I believe Mo will paddle a new custom Rogue unlimited, which he seemed pretty damn excited about when I spoke with him in Europe. Kody Kerbox has enormous experience in this event as well; might not be able to match the very top contenders, but look for him to sneak into the top five. 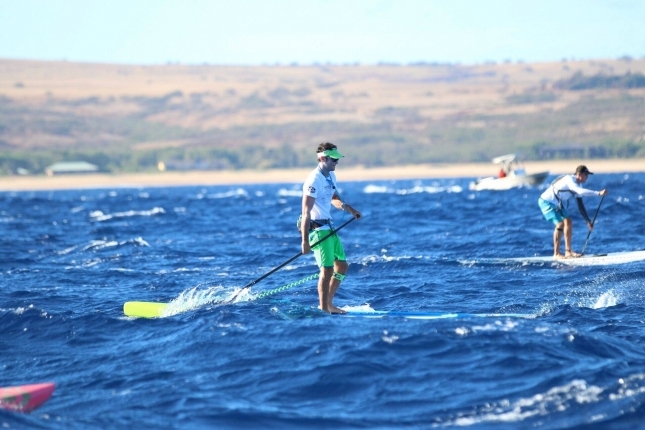 Though based on his Instagram feed, he’d probably rather be foiling than paddling. But we can’t write-off the former champs. Travis Grant and Connor Baxter have, except for Kai’s victory two years ago, completely owned this race for almost a decade now and will be bloody difficult to dethrone. Six victories between them dating back to 2011 when Connor won his first title. Connor is hungry to wrestle back his title after going oh-so-close with Trav 12 months ago, and will be fueled by the fact his other results this season have been below par. Connor has never looked fitter (and this is an endurance race if there ever was one), so if the conditions fire as expected then guys like Titou and Linc will have to race very, very smart to keep pace with Conbax. Trav is always impossible to read. He just doesn’t care about racing in general, which only seems to elevate his stature in the sport even more, but he does care about Molokai. It’s the one race he’ll happily admit he wants to win, even though he’s already won it three times–equal with Connor as the most successful male SUP athlete in the event’s history. Trav showed in Carolina that he hasn’t ceded pace to the kids just yet, and if the bumps are firing he’ll have as good a chance of anyone. The big news is the late withdrawal of current Paddle League ratings leader Michael Booth, who’s staying home in Oz after his old man had a health shock this week. Boothy, who’s been damn near untouchable in the “regular” races this season, was quietly focused on claiming this prestigious title and cementing his growing reputation as the world’s best, but he’ll have to wait another 12 months to prove he’s got what it takes to assume Connor’s crown of “best all-round paddler in the world.” I’m not sure the Aussie powerhouse would have started favourite at Molokai, but at the very least he would’ve been a podium certainty. This is the hardest Molokai I’ve ever tried to predict. The top six or seven guys all have a realistic shot of winning, and I won’t be surprised if any of them are either on top of the podium or stuck outside the top five. You could throw a blanket over the field. The stock battle always plays second fiddle to the unlimited arm-wrestle, but as always we’ve got a few ocean masters fighting for the title in what should be a gripping contest. Josh Riccio is known as the stock king in Hawaii, but he’ll have his work cut out with Molokai veteran and hugely under-rated ocean athlete Vinni Martins stepping down from unlimited to 14′ to please his sponsors. Throw in the journeyman Andrew Logreco – one of the most experienced guys in this race, period – and the unassuming Niuhiti Buillard from Tahiti (past champion of the stock class) and just hitting top three will be a mission for anyone in the stock class this year. The women’s field is, as always, tiny, with just six women in the unlimited and another two in the stock class. But fortunately that unlimited battle includes 4x former champions covering every title of the present decade except one (just missing 2012 champ Talia). 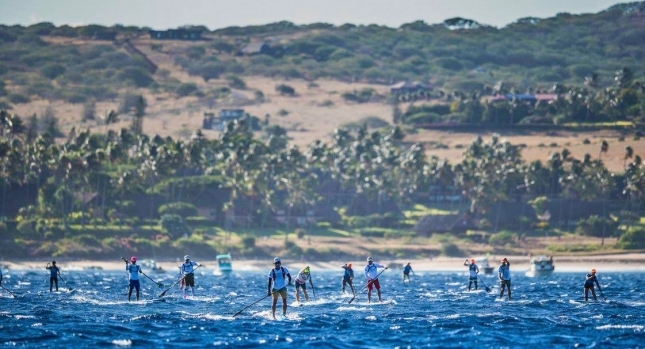 So while the field isn’t quite as deep, the women’s Molokai title is just as difficult to win as the men’s. The former queen Andrea Moller is still a threat, but she already conceded her crown a few years ago to Sonni Honscheid. 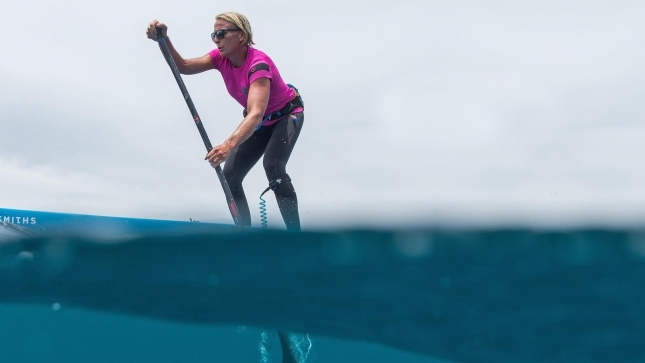 Penelope Strickland was a surprise winner last year, or at least a surprise to anyone that didn’t yet know just how much of a tenacious ocean fighter this woman is. We haven’t really seen Pea race this year though so it’s hard to gauge her form, but given her dominance in 2017 the Kiwi is at least a safe bet for the podium. Given her three-peat history in this event and stellar form so far this season – she’s almost completely secured The Paddle League World Title before the season was half over – it’s *very* hard to go past Sonni Honscheid. The only question is how quickly she gets accustomed to the new Starboard unlimited, which I *believe* Sonni will be riding. We haven’t seen much of this board in the wild, though Boothy was confident he could win Molokai on it so Sonni should feel equally prepared for her fourth title. Sonni’s biggest challenge will probably come from Aussie Terrene Black. Terrene saluted in 2013 and continues to be one of the strongest women in the sport half a decade later. In the stock class, look for Maui’s Annie Reickert to claim the title and see just how close she can stick to the unlimited women. UPDATE: Annie has made a last-minute change to the foil division, making her the first woman to ever foil the channel. Exciting to watch! While the main event is still the paddleboarding, the debut of a dedicated foil division this year is certain to create strong interest from fans and media alike. The sheer novelty alone is worth a look, but the fact our sport’s only genuine superstar is lining up on this part of the beach will add instant hype. Can we all presume Kai Lenny for the win? Probably. He’s not unstoppable; Kai only narrowly beat Kody Kerbox in the Maliko foil race last week, while he lost to the Spencer brothers at Hood River last year. Kody is racing a traditional unlimited this year though, while the Spencers were off the pace on Maliko last week, so Kai’s main competition is probably the conditions. Foiling is the reverse of boxing: the lighter the winds, the harder foiling becomes for heavier athletes. Kai is hardly a super heavyweight, but he does concede quite a few kgs to teenager foiling prodigies such as the Spencer boys and ultra-dark-horse Nathan van Vuuren (who placed third last week). But still, you’d be very brave to put your money on anyone but Kai. He doesn’t just have the talent, he has the desire. He clearly wants this. The rise of modern-day foiling is largely attributed to him, and this was the one race he desperately wanted to win during his SUP racing heydey (which he finally ticked off in 2016). Victory would be a bonanza not just for his incredible career accomplishments but his lucrative sponsorships as well. I mean c’mon, the foil board he’s riding is even painted to look like a can of Red Bull. Kai, who departed lifelong sponsor Naish back in January, is also in the midst of launching “THE HYDROFOIL COMPANY” (must be written in full caps, apparently) along with his brother Ridge and the crew from MFC (Maui Fin Company). Following the #HYDROS on Instagram the past week, one gets the sense that Molokai is being utilised as one big launch party for the brand. But no matter who wins, this will be a historic year as paddling’s newest form-factor gets its first official outing on paddling’s biggest stage. Foiling is an entirely different sport to regular SUP racing, of course, so there’s no use comparing records and times – “oranges & apples” and all that – but it’s still pretty damn exciting to see ocean racing evolve, so I’m eager to see the boys do their thing on Sunday (no women have entered the foil division). So there you go. That’s your rough form guide for Molokai 2018. Between the stacked unlimited field, the intriguing stock battle, the quartet of women’s champions and the new-school foilers, this year’s M2O is shaping up to be the biggest one yet in the 22 years this extraordinary race has been going. And let’s not forget the prone paddlers – the ones who actually started this event and laid the foundations for what it’s become. I’m not a prone expert, but look for Harriett Brown in the women’s and 2017 champ Matt Bevilacqua. They’re both Aussies. It’s actually quite extraordinary just how dominant Australia has been at Molokai in both the stand up and prone divisions (who could forget Jamie Mitchell’s “Decade of Dominance”). Follow the race with LIVE updates on the official Molokai-2-Oahu Facebook page – you can follow the GPS tracking map and regular updates, and then watch a Facebook Live stream from the finish line as the winners come in.